Everyone has hero’s. And some of those people deserve our adulation more then others. Some are considered hero’s because they can sing really well or because they are tall and thin and beautiful and some are considered hero’s because they have shown incredible courage in the face of adversity or helped to win a war or discovered a cure for a deadly disease. We all have hero’s. In Israel many of our leaders are considered to be hero’s of the people. People like Menachem Begin z”l, Yitzchak Rabin z”l, Shimon Peres and Ariel Sharon. Whether we agree or disagree with their politics the fact of the matter is that these are men who are lauded because they were present through the establishment of the state. They fought the wars, they led battles, they saved lives and they lost family and friends.They built this country with their blood, sweat and tears.They well deserve their hero status , and we know all about their lives. Whether they were pushed into politics or went willingly they became the leaders of our country and thus they became our well known hero’s. Today I met a man. An 89 year old man living in an assisted living home in Tel Aviv. Most of the residents of this home are survivors of the Holocaust. It was my fortune to talk to this man named Yeshaya. He was from Czechoslovakia. Or Hungary. It had been divided so I am not sure which side he was on when he was sent to a work camp in Austria. He was one of 10 children. He lost his whole family except for one sister. Two from a family of 12 left over from Hitlers attempt to annihilate us. After his miraculous survival he had the choice to go to America or to Israel. To him the choice was clear-the Jewish Homeland was the only direction he was headed. He was one of the “maapilim”, the groups of people who tried to sneak into then Palestine via the sea. He came over on a boat, made the illegal landing on the coast and was immediately caught by the British and sent to Cyprus to a detention camp. He put his time on the island to good use and learnt Hebrew while there. In 1948 during the War of Independence he fought at the battle of the Kastel. I have been to the Kastel twice on tiyulim. Yeshaya, well, he was shot in the leg as he fought to try to keep this important strong hold. In 1967 he fought yet again, this time as part of the unit of soldiers who re-captured our Kotel. I can not even imagine what that was like but I know he had tears in his eyes while he was telling me about it. Meanwhile, somewhere in all those years he met and married his wife-a survivor also. And from him, this one of two survivors from a family of 12 that Hitler tried to wipe out completely there are now 50 descendants. 50 Jewish children, grandchildren and great grandchildren that this man has brought into this world. And as I sat and talked to Yeshaya and heard his story I realized that here, next to me, is a hero as big as any of the other great ones who have led our country, and bigger by far then some of the other people out there who have been labeled as such. And it is mind boggling to think that he is only one of many, one of thousands of hero’s who built this country. How fortunate we are to live in this country and to have the opportunity to meet people like this. To quote Mr. Rogers, “These are the people in my neighborhood”. And what a wonderful, special, amazing neighborhood it is. 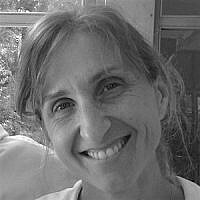 Chani Turk made aliyah with her family in 2004. They have been living in Modiin ever since.